Where does the dew on blades of grass come from? As fall begins, we have lots of mornings with dew on the grass. To explain this, we start with the fact that air contains water in the gas phase, called water vapor. Dew is made of liquid water that has condensed from that water vapor. Dew occurs when objects cool, such as when drops of liquid form on the outside of an ice-cold drink glass. Dew forms when the object, such as the glass, cools down to the dew point temperature. 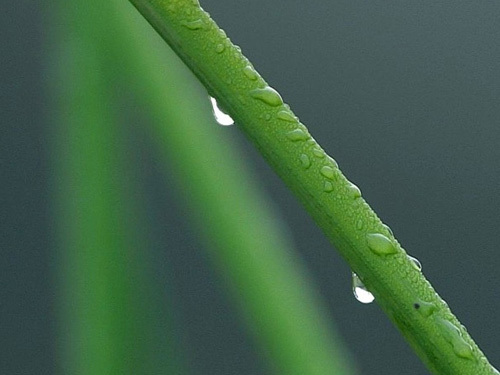 Water molecules in the air continually bombard surfaces, like blades of grass. Some of the molecules stick, forming a very thin film of water. This film may not last long, as the water is also evaporating. The evaporation rate depends on the water temperature, which equals the temperature on the grass. So condensation depends on the state of the atmosphere (primarily temperature and moisture), while evaporation depends on the temperature of the object. If the object gets cold enough, and the air contains enough moisture, condensation exceeds evaporation, and the film grows into dew drops. Each night the weather report includes the temperature and the dew point temperature. If the two temperatures are close, dew is likely during the night. Because wind and cloudy skies keep the ground from cooling, dew also tends to form on calm nights with clear skies.